Back in 1932 gold prospectors Cecil Main and Frank Carr came upon something strange after dynamiting a vein in the San Pedro Mountains of Wyoming. One of the dynamite blasts opened a small cavern in the rock that measured about 15 feet long and four feet in height. The miners said the cavern had been totally sealed from the outside world by a thick wall of rock until they blasted it open. Yet inside the cavern Main and Carr found a fourteen-inch high mummified life form, sitting cross-legged on a small ledge. They said it had a humanoid form, with a face that looked like an old man. The head was flat, with large, heavy-lidded eyes and an unusually wide mouth. The body was so well preserved even the finger nails were visible on the hands. A dark, jelly-like substance covered the top of the head. 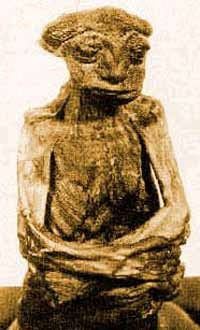 The tiny mummy was taken to nearby Caspar, Wyoming, where the find became a media sensation. Scientists from all over the country came to Caspar to examine the body, many of them attempting to prove a hoax. Extensive tests, plus X-rays of the body conducted by anthropologist Dr. Henry Shapiro, of the American Museum of Natural History, showed that the body contained a perfectly formed human skeleton. Also revealed was that the entity had been murdered. The spine was damaged, the collarbone broken, and the skull was crushed by some kind of heavy blow. The gelatin substance on the head was found to be exposed brain tissue and blood. The body was determined to be a fully developed adult of about 65 years of age. The remains remained the private property of the two prospectors. It was displayed in sideshows for several years until it was sold by Carr to Ivan T. Goodman, a Casper auto dealer. Goodman took it to New York City where it was studied with X-rays. After Goodman died in 1950, the mummy passed into the hands of a Leonard Waller and has not been seen since. The mystery of just who and what this entity was, how old it was, who killed it, and how it became sealed in the mountain has remained unsolved. It is said there was a legend by the Shoshone Nation of Wyoming that there once existed a race of tiny people known as the Nimerigar. The Shoshone said these little people would attack them with tiny bows and poisoned arrows. They said the Nimerigar killed their own kind with a blow to the head when they became too old or too ill to remain a useful part of their society. It was a story reminiscent of the native legends of "little people" told all over the world. Other names for this tribe of people included geow-lud-mo-sis-eg, nunnehi, yunwi and tsunsdi. The discovery of the tiny mummy in the rock adds some credence to the legend.